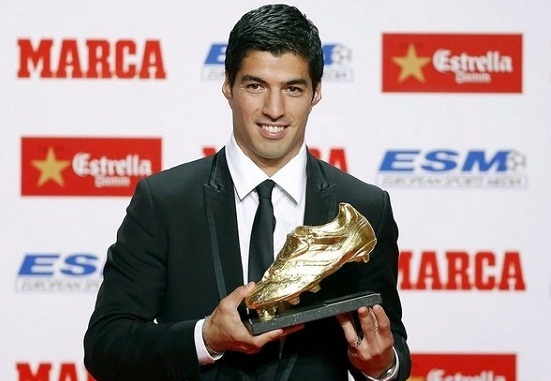 Luis Suarez received a Second European Golden Shoe of his career after becoming the leading scorer in Europe's top domestic leagues last season. The 29-year old Barcelona forward scored 40 goals in 35 La Liga starts, helping Barca retain the Spanish title. He ended the 2015-16 campaign with 59 goals in 52 appearances for Barca in all competitions. His other golden shoe award came with Liverpool in the 2013-14 when he scored 31 times to help the Reds finish runners-up in the Premier League. He shared the prize that year with Real Madrid's Cristiano Ronaldo. Luis Alberto Suárez Díaz (born 24 January 1987) is a Uruguayan professional footballer who plays as a striker for Spanish club FC Barcelona and the Uruguay national team. In July 2014, he moved from Liverpool to Barcelona for a fee of £64.98 million (82.3 million), making him one of the most expensive players in football history. The transfer took place after he had won the European Golden Shoe in the previous season with Liverpool. Suárez is widely regarded as one of the best strikers in the world. In October 2015, he scored his 300th senior career goal for club and country.